New Yorkers | Fidel's Wandering Eye. Sleep…it seems like such a simple thing. You get tired, you lay down, you close your eyes and eventually it comes. For many New Yorkers however, sleep is a luxury not so easily afforded. There is so much to see and do in the Big Apple and so little time to do it all. Work gets in the way. Family gets in the way. The everyday responsibilities that end up taking longer than usual get in the way. 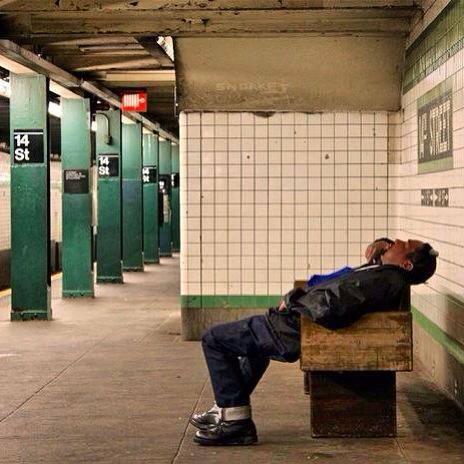 So you sleep where you can, when you can…sometimes even on a subway bench. A couple days ago I boarded the downtown 4 express train, headed for Union Square. As the doors closed and the train began to move, I found myself a seat and began to fumble with my iPod. Before finding the song I was looking for (Coldplay’s Viva La Vida…for those of you that are REALLY into details) I happened to glance across the subway car to the seats in front of me and saw one of the most beautiful women I’ve ever laid eyes on. Her hair was long and the darkest of browns, almost black…dyed slightly lighter at the tips and pulled into a single large braid behind her. Her skin was light, internationally mixed and absolutely flawless: the kind of color you get when you pour a little too much fresh milk into your morning coffee. Her eyebrows were dark and thin, her face classic, the only modern touch was a single tiny golden stud in her left nostril. She wore a sleek and perfectly fitting top and a simple skirt, which in my opinion happened to be exactly the length and style that a perfect lady would wear. Her long, full legs were in a pair of black heels that you just wanted to buy ten more pairs of in ten different colors for her JUST because she looked so good in them. But I digress…where was I? The point is, how does one start a conversation with a woman who has probably already shot down ten other men better than you just in the last hour?? What perfectly original, sincerely smooth, ear-opening comment do you make to such a woman? How do I speak to her? How do I tell her that she’s absolutely stunning and even though I don’t know her in any way, shape or form, I feel that my day might be a little more grey if I don’t continue to look in her direction? How do I explain to her that if she’s at all as interesting, funny, cool, or understanding as I THINK she might be, than she should let me take her out, wine and dine her, meet her parents, prove my love, propose and grow old with her until we both die happily like those two fools in The Notebook…??? How do I tell her…? 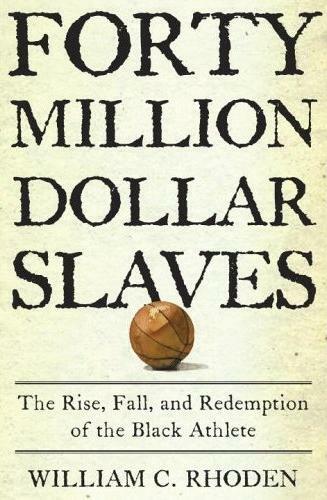 I look up…she’s standing above me, $40 Million Dollar Slaves in her hand. She sits next to me and reaches into her purse. She blushes ever so slightly. She pulls her hand from her purse…it’s holding a business card. Before I can part my lips to speak, the doors open, she smiles again and leaves me sitting there on the downtown 4 express train. I simply put the card in my jacket pocket, go back to fumbling with my iPod and begin laughing aloud like some kind of crazed lunatic. I love NY, and I love the fact that it made me the New Yorker I am today. I also love my fellow New Yorkers, and not just because they all happen to live in New York, arguably the most well known, talked about, and sought after city in the world. New Yorkers are so much more than that. They’re all from other places, which makes them the closest thing to being European/American. This, as you guys know, is exactly what I am…so I hold a personal, biased love for them. Us New Yorkers also have the ability to be able to tell you exactly what we’re thinking, any time of day, all day, every day, twice, in very few words…which usually start with the letter “F”. It is this brass, forward, confident, self-empowering style that caused me to immediately fall for this big, bad, Apple. 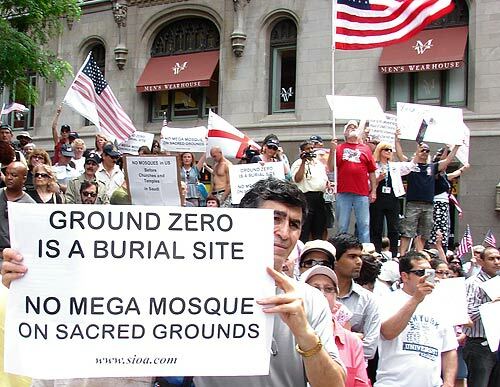 It is perhaps due to the intimate relationship I have with the City (NY gets the big “C”) that never sleeps that I’m exactly torn down the middle of this “mosque being built near the 9/11 site” issue. Well, that and the fact that I’m half American, and probably bleed red, white, and blue…Italian white though. 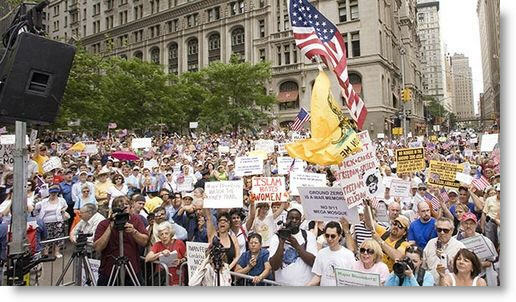 Half of me is proud of the fact that Mayor Bloomberg and “the gang” want the mosque to go up based simply on the fact that we’re America (hell yeah), and anyone can be American (except illegal aliens, terrorists, and a few select folks in Arizona), and everyone has the right to worship who they want to worship (unless the person you want to worship is David Koresh) here in America. We’re fair, that’s our story, and we’re sticking to it. We have to be stand by what we said, and we have to lead by example, and be right…even when that means doing something that may seem wrong. That’s the way that we, as Americans, are going to do things around here because we have rules…AMERICAN rules, and those will never die. Born in the U.S.A. Talk to me Goose. Some folks were made to wave the flag, ooooh, that red white and blue. 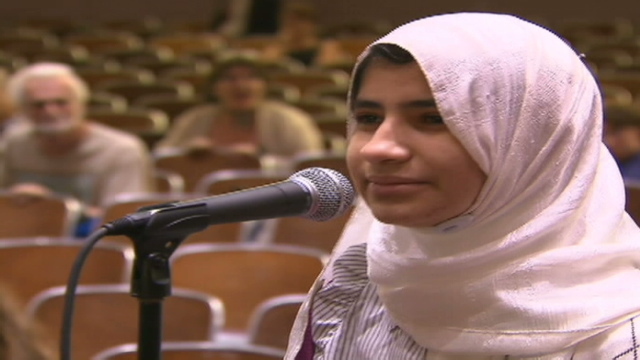 The flip-side of that coin however, is me thinking “You wanna build a mosque WHERE..?” Not because the people building it are Muslim, or Arab, or believe in a different God than I do…or whatever else it is everyone who’s against them is complaining about. I just think it’s a little sketchy because it was folks from that way of life (allegedly), representing that nation (supposedly), and claiming to be followers of that religion (probably) that most of us here in America don’t follow. 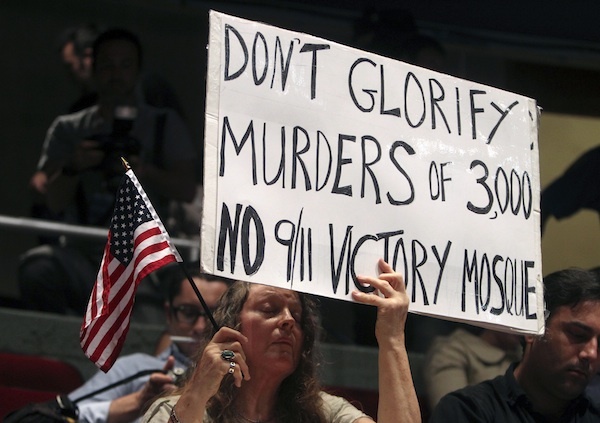 Call me crazy, but folks who have all that in common with the terrorists that caused one of the most tragically memorable moments in America’s history would have to have some major balls to just want to build their place of praise…well…right there. Wasn’t there some other block in this gigantic City that they could’ve chosen..?? That’s kind of like the relatives of the person who killed your kids asking you and your spouse if they can move in across the hall from you. This is officially the first time I’ve ever ended one of my blog entries with a question, but as I have no official position (because I’m having trouble choosing one), and I really don’t know what else to say, it seems like just this once, it may be the correct thing to do. Tagged as America, Fidel Amos, Fidel's Wandering Eye, I Love New York, Mayor Bloomberg, Mosques, New York City, New Yorkers, Religion, Terrorists, U.S.